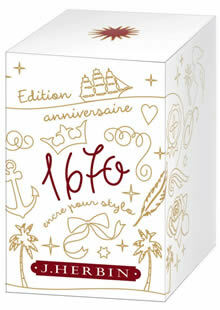 The 1670 Collection celebrates the rich life and adventures of Herbin, an enterprising French sailor of the mid-17th century. 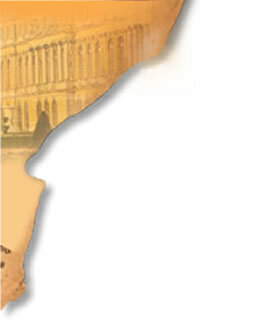 While he was in the employ of the Compagnie des Indes Orientales, he made a number of voyages to India, collecting ingredients and formulas for his sealing wax and inks. Herbin was fond of dried carob pods as a healthy food during his voyages. 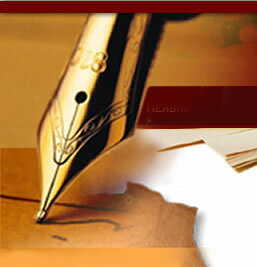 As with other merchants, he traded or purchased them in Cyprus. Carob trees have been cultivated in Mediterranean countries since ancient times. Carob pods were known for their therapeutic properties and were marketed throughout Europe as the "black gold of Cyprus." 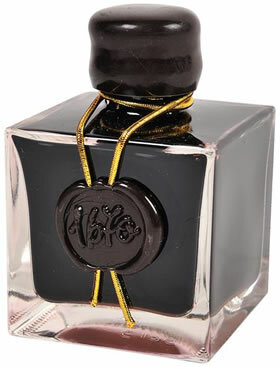 This new anniversary ink is called "Caroube de Chypre" - Cyprus Carob - because of its deep brown color. 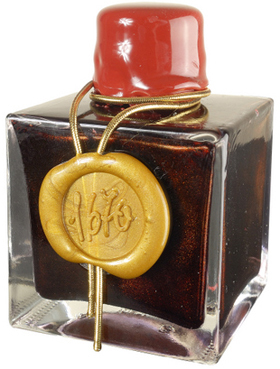 Caroube de Chypre is a dark brown ink with light red reflections and sparkling gold effect. 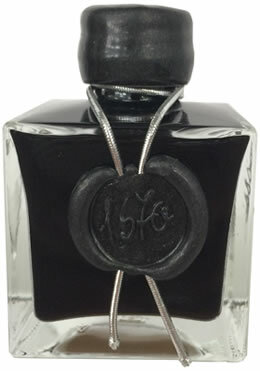 Herbin is said to have kept an emerald in his pocket during his voyages as a good luck charm. These precious gemstones have been treasured for centuries for having magical healing properties and as protective talismans. One of the purest emerald deposits in the world, the Chivor mine in the Andes was discovered in the middle of the 16th century by Spanish conquistadors. Chivor emeralds were much in demand, and the royalty of India, Persia and Turkey sought the New World treasures once the gems arrived in Europe. Emeralds were enormously popular in the Mughal Court of India, whose rulers referred to them as "Tears of the Moon" because of their opaque transparency. Stormy seas are the inspiration for Herbin’s 1670 ink, “Stormy Grey.” Its color is a deep coal grey (anthracite) with flecks of gold. On his many voyages, Herbin encountered dark and wild oceans. The fine golden flecks in the ink are meant to invoke both strikes of lightening across the water, and also its dark and mysterious depths. 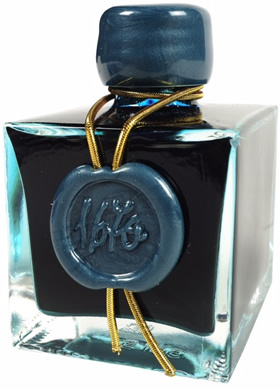 The deep blue ink with a golden sheen recalls the sea voyages of Herbin to the Mughal Empire of India. In those days India was a primary supplier of indigo dye. 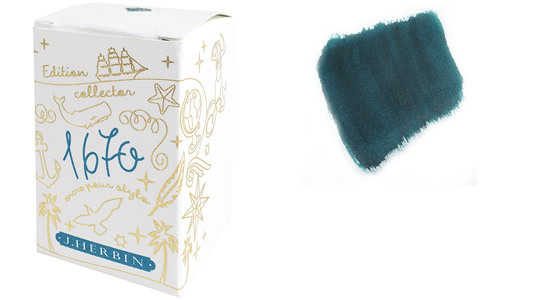 Bleu Ocean takes its inspiration from those adventurous journeys. 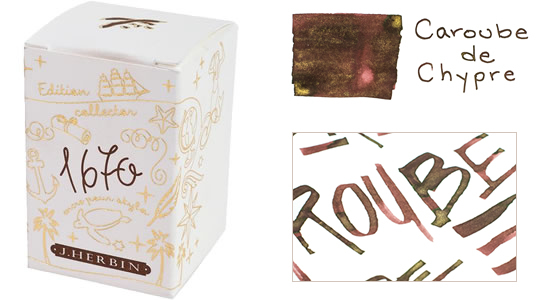 To celebrate the 340th anniversary of the founding of Herbin, we introduced a new color, "Rouge Hematite," especially made for this event. 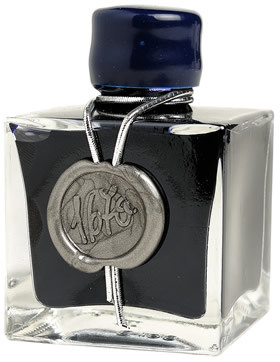 The sealing wax on the bottle is reminiscent of the Herbin wax used for the "grand cru" wines of France. 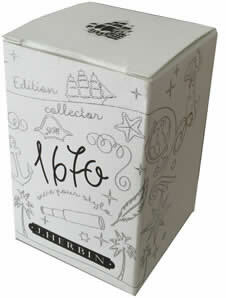 The design on the box represents the life of Herbin. The ship, anchor and palm tree represent navigation and discovery. The crown is a reference to the red sealing wax used by the royal court.